Description of "The Woman From Planet Alpha 1 (eBook)"
Researcher of esoteric subjects with more than 45 years dedicated to the phenomenology of life and of human beings. It's parapsychologist , occult specialist , mentalist , hypnotist and naturist . Participates in the International Metaphysical Association , the Rosicrucian lodge San Jose California, the Great Universal Brotherhood and the Great White Brotherhood . Collaborates with several international organizations related to the topic of UFO and alien contact . As speaker, Burdman has addressed issues such as color therapy, numerology, astrology, geomancy , card reading , specializing in the major arcana of the tarot and aromatherapy. He has researched and practiced for many years white magic and has specialized in the subject fake diseases. The author has studied theosophy , philosophy and Kabbalah. He has researched pyramid energy healing and has worked its application in the development of paranormal abilities . Using findings from regressive hypnosis states that reincarnation -a recurring theme of the author's study- is an undeniable fact . Fourteen books include the endorsement of their dedication to the study of esoteric and paranormal topics. He received the Golden Eagle Award as a parapsychologist and Venezuela in 1991 mentalist Burdman Vladimir expands its research sharing their knowledge to help the spiritual awakening of man and promote the expansion of human consciousness . Crystal Shade: Angeni, Volume 1 by Istvan Szabo Ifj. 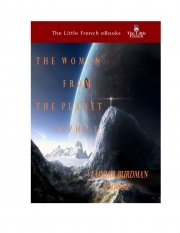 Reviews of "The Woman From Planet Alpha 1 (eBook)"